An imposing crag directly above the picturesque village with quality routes of all grades good for a couple of years of climbing – what more could you ask for? 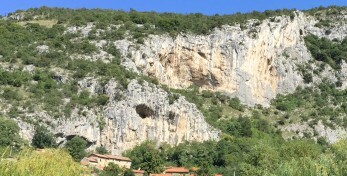 Banje (also called Behind the village) is a playground for technical climbers with vertical routes, which are surrounded on both sides by overhangs. 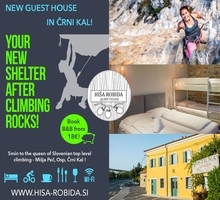 Babna (also called The Balcony) is considered the most popular crag in the area, being just a bit harder than Črni Kal and easier than Mišja peč, with long routes on vertical and slightly overhanging walls. In the last few years a suitable parking space is always a pressing issue for the climbing community who can‘t find a common ground with the villagers. 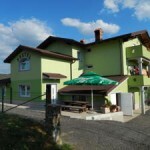 The situation changes all the time, but it is always forbidden to park in the village or on side driveways. Park in the Mišja peč parking space or ask in camp Vovk for alternatives. Otherwise the approach is simple: use one of the two paths uphill through the village and you will soon reach the first crag (turn right and up upon reaching the church). For Babna the path extends onwards and uphill. Use only clear, official paths. Ideal periods are spring and autumn and also winter (if the temperatures hold above 10º C and the wind isn‘t too crazy). 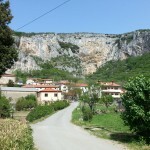 In summer it quickly becomes too hot, but you can catch some climbing in Banje. You can do some climbing even in light rain – but if it gets worse, run away to neighbouring Mišja peč. After the rain the wall dries quickly, except for the tufa. Osp is very well maintained. The bolts are new and bolted in a friendly fashion. There are anchors with carabiners almost everywhere. The quality of the rock is also great – but be careful while climbing longer routes on the right side of Babna, where an occasional hold may break off. 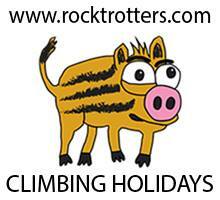 Sometimes a loose rock may be launched on the climbers by naughty animals above the wall. The comfort under the wall is generally excellent, even for children – if they manage to walk all the way up. The standard gear is adequate. Still, be aware of the route lengths – sometimes even an 80 m rope is a bit short. You need almost 20 QDs for longer routes. 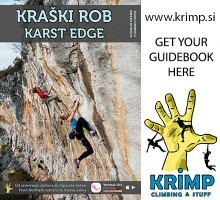 Banje is characterized by vertical routes of middle grades and a bit harder routes over the bulges with explicit cruxes. Babna is more diverse and offers a lot of joy for complete beginners in vertical routes on sharp holds, requiring good footwork. Harder routes in 7s become slightly overhanging, long, technical endurance pieces, and later also the power comes into play. Around 8s the routes start to dwindle. There are also some (average) multipitches. Old routes can be very polished and many are full of artificially chiped holds. In 1988 Osp hosted the famous state championship of Yugoslavia – though one of many it made quite a splash, and though it was dubbed for the “natural“ wall, all the routes of that time are artificially chipped – like Paris-Dakar, Ženski četrtfinale 88, Olympic,… After three days the winners were Vili Guček and Simona Škarja. Carefully read the climbers’ code of etiquette, and follow it everywhere! Apart from that the Osp area is especially sensitive. Do not provoke locals with unsuitable parking or behaviour, stealing fruit, leaving trash and doing anything that you wouldn‘t tolerate from others on your own garden.